Chapter 1: What is nicotine? Chapter 2: Is nicotine addictive? Chapter 3: What is the extent and impact of tobacco use? Chapter 4: How does nicotine deliver its effect? Chapter 5: What happens when nicotine is taken for long periods of time? Chapter 6: What are the medical consequences of nicotine use? Chapter 7: Smoking and pregnancy: What are the risks? Chapter 8: Are there effective treatments for nicotine addiction? Chapter 9: Are there gender differences in tobacco smoking? The use of tobacco products may be the Nation’s most critical public health problem. It is, in fact, addiction to nicotine that is at the root of this enormous health, social, and financial burden. An improved overall understanding of addiction, coupled with the identification of nicotine as an addictive drug, has been instrumental in the development of medications and behavioral treatments for nicotine addiction. In essence, science-driven treatment development has provided to consumers the option to easily purchase effective treatments, such as the nicotine patch and nicotine gum, in their local drugstores and supermarkets. Science has also shown that treating addiction with medications alone is not nearly as effective as when the medication is coupled with a behavioral approach. While we have made substantial progress in developing both pharmacological and behavioral treatments that have proven effective for many people, much more remains to be done. Through the use of advanced neuroimaging technologies, we are now actually able to see some of the changes in brain function that occur as people smoke tobacco products. Researchers are beginning to find that there may be chemicals other than nicotine in cigarette smoke that contribute to tobacco’s addictiveness. This finding and many other new research accomplishments in the addiction arena are providing us with an unprecedented opportunity to curtail this enormous public health crisis. We hope this compilation of scientific information will help to inform readers about our current understanding of nicotine addiction and its harmful effects and will assist in prevention and treatment efforts. *Individual with reports smoking one or more cigarettes during the previous 30 days. What people frequently do not realize is that the cigarette is a very efficient and highly engineered drug-delivery system. By inhaling, the smoker can get nicotine to the brain very rapidly with every puff. A typical smoker will take 10 puffs on a cigarette over a period of 5 minutes that the cigarette is lit. Thus, a person who smokes about 1-1/2 packs (30 cigarettes) daily, gets 300 "hits" of nicotine to the brain each day. These factors contribute considerably to nicotine’s highly addictive nature. Scientific research is also beginning to show that nicotine may not be the only psychoactive ingredient in tobacco. Using advanced neuroimaging technology, scientists can see the dramatic effect of cigarette smoking on the brain and are finding a marked decrease in the levels of monoamineoxidase (MAO), an important enzyme that is responsible for breaking down dopamine. The change in MAO must be caused by some tobacco smoke ingredient other than nicotine, since we know that nicotine itself does not dramatically alter MAO levels. The decrease in two forms of MAO, A and B, then results in higher dopamine levels and may be another reason that smokers continue to smoke - to sustain the high dopamine levels that result in the desire for repeated drug use. According to the 1999 National Household Survey on Drug Abuse, an estimated 57.0 million Americans were current smokers and 7.6 million used smokeless tobacco, which means that nicotine is one of the most widely abused substances. 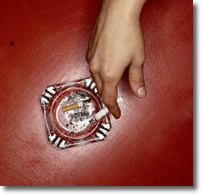 In addition, in 1998 each day in the United States more than 2,000 people under the age of 18 began daily smoking. According to the Centers for Disease Control and Prevention (CDC), the prevalence of cigarette smoking among U.S. high school students increased from 27.5 percent in 1991 to 36.4 percent in 1997 before declining to 34.8 percent in 1999. NIDA’s own Monitoring the Future Study, which annually surveys drug use and related attitudes of America’s adolescents, also found the prevalence rates for smoking among youth declined from 1999 to 2000. Since 1975, nicotine in the form of cigarettes has consistently been the substance the greatest number of high school students use daily. The impact of nicotine addiction in terms of morbidity, mortality, and economic costs to society is staggering. Tobacco kills more than 430,000 U.S. citizens each year-more than alcohol, cocaine, heroin, homicide, suicide, car accidents, fire, and AIDS combined. Tobacco use is the leading preventable cause of death in the United States. Economically, an estimated $80 billion of total U.S. health care costs each year is attributable to smoking. However, this cost is well below the total cost to society because it does not include burn care from smoking-related fires, perinatal care for low-birth-weight infants of mothers who smoke, and medical care costs associated with disease caused by secondhand smoke. Taken together, the direct and indirect costs of smoking are estimated at $138 billion per year. 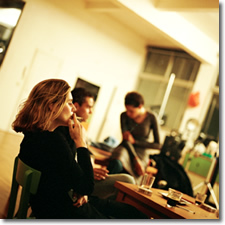 Nicotine can act as both a stimulant and a sedative. Immediately after exposure to nicotine, there is a "kick" caused in part by the drug’s stimulation of the adrenal glands and resulting discharge of epinephrine (adrenaline). The rush of adrenaline stimulates the body and causes a sudden release of glucose as well as an increase in blood pressure, respiration, and heart rate. Nicotine also suppresses insulin output from the pancreas, which means that smokers are always slightly hyperglycemic. In addition, nicotine indirectly causes a release of dopamine in the brain regions that control pleasure and motivation. This reaction is similar to that seen with other drugs of abuse-such as cocaine and heroin- and it is thought to underlie the pleasurable sensations experienced by many smokers. In contrast, nicotine can also exert a sedative effect, depending on the level of the smoker’s nervous system arousal and the dose of nicotine taken. Repeated exposure to nicotine results in the development of tolerance, the condition in which higher doses of a drug are required to produce the same initial stimulation. Nicotine is metabolized fairly rapidly, disappearing from the body in a few hours. Therefore some tolerance is lost overnight, and smokers often report that the first cigarettes of the day are the strongest and/or the "best." As the day progresses, acute tolerance develops, and later cigarettes have less effect. The medical consequences of nicotine exposure result from effects of both the nicotine itself and how it is taken. The most deleterious effects of nicotine addiction are the result of tobacco use, which accounts for one-third of all cancers. Foremost among the cancers caused by tobacco is lung cancer-the number one cancer killer of both men and women. Cigarette smoking has been linked to about 90 percent of all lung cancer cases. While we often think of medical consequences that result from direct use of tobacco products, passive or secondary smoke also increases the risk for many diseases. Environmental tobacco smoke (ETS) is a major source of indoor air contaminants; secondhand smoke is estimated to cause approximately 3,000 lung cancer deaths per year among nonsmokers and contributes to as many as 40,000 deaths related to cardiovascular disease. Exposure to tobacco smoke in the home increases the severity of asthma for children and is a risk factor for new cases of childhood asthma. ETS exposure has been linked also with sudden infant death syndrome. Additionally, dropped cigarettes are the leading cause of residential fire fatalities, leading to more than 1,000 such deaths each year. At higher doses, such as the nicotine that can be found in some insecticide sprays, nicotine can be extremely toxic, causing vomiting, tremors, convulsions, and death. Nicotine poisoning has been reported from accidental ingestion of insecticides by adults and ingestion of tobacco products by children and pets. 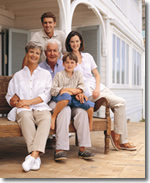 Death usually results in a few minutes from respiratory failure caused by paralysis. Nicotine was the first pharmacological agent approved by the Food and Drug Administration (FDA) for use in smoking cessation therapy. 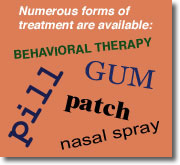 Nicotine replacement therapies, such as nicotine gum, the transdermal patch, nasal spray, and inhaler, have been approved for use in the United States. They are used to relieve withdrawal symptoms, because they produce less severe physiological alterations than tobacco-based systems, and generally provide users with lower overall nicotine levels than they receive with tobacco. An added benefit is that these forms of nicotine have little abuse potential since they do not produce the pleasurable effects of tobacco products. Nor do they contain the carcinogens and gases associated with tobacco smoke. The FDA’s approval of nicotine gum in 1984 marked the availability (by prescription) of the first nicotine replacement therapy on the U.S. market. In 1996, the FDA approved gum (Nicorette®) for over-the-counter sales. Whereas nicotine gum provides some smokers with the desired control over dose and ability to relieve cravings, others are unable to tolerate the taste and chewing demands. In 1991-1992, FDA approved four transdermal nicotine patches, two of which became over-the-counter products in 1996, thus meeting the needs of many additional tobacco users. Since the introduction of nicotine gum and the transdermal patch, estimates based on FDA and pharmaceutical industry data indicate that more than 1 million individuals have been successfully treated for nicotine addiction. In 1996 a nicotine nasal spray, and in 1998 a nicotine inhaler, became available by prescription. All the nicotine replacement products- gum, patch, spray and inhaler- appear to be equally effective. In fact, the over-the-counter availability of many of these medications, combined with increased messages to quit smoking in the media, has produced about a 20 percent increase in successful quitting each year. Although the major focus of pharmacological treatments of nicotine addiction has been nicotine replacement, other treatments are being developed for relief of nicotine withdrawal symptoms. For example, the first non-nicotine prescription drug, bupropion, an antidepressant marketed as Zyban®, has been approved for use as a pharmacological treatment for nicotine addiction. In December 1996, a Federal advisory committee recommended that the FDA approve bupropion to become the first drug to help people quit smoking that could be taken in pill form, and the first to contain no nicotine. Behavioral interventions can play an integral role in nicotine addiction treatment. Over the past decade, this approach has spread from primarily clinic-based, formal smoking-cessation programs to application in numerous community and public health settings, and now to telephone and written formats as well. In general, behavioral methods are employed to (a) discover high-risk relapse situations, (b) create an aversion to smoking, (c) develop self-monitoring of smoking behavior, and (d) establish competing coping responses. 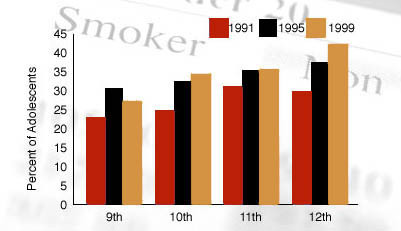 The number of smokers in the United States declined in the 1970s and 1980s, but has been relatively stable throughout the 1990s. 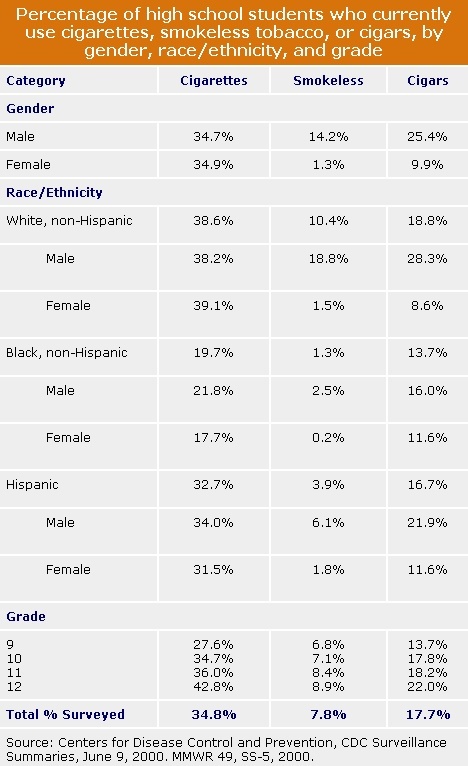 Because this decline of smoking was greater among men than women, the prevalence of smoking is only slightly higher for men today than it is for women. Several factors appear to be contributing to this trend, including increased initiation of smoking among female teens and, more critically, women being less likely than men to quit smoking. Adrenal glands: Glands located above each kidney that secrete hormones, e.g., adrenaline. 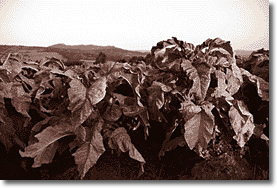 Nicotine: An alkaloid derived from the tobacco plant that is responsible for smoking’s psychoactive and addictive effects; is toxic at high doses but can be safe and effective as medicine at lower doses. Pharmacokinetics: The pattern of absorption, distribution, and excretion of a drug over time. Withdrawal: A variety of symptoms that occur after use of an addictive drug is reduced or stopped. Bartecchi, C.E. ; MacKenzie, T.D. ; and Schrier, R.W. 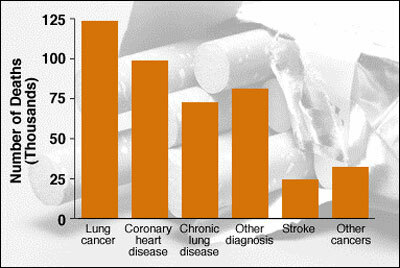 Human costs of tobacco use. New Engl J Med 330:907-980, 1994. Benowitz, N.L. Pharmacology of nicotine: addiction and therapeutics. Ann Rev Pharmacol Toxicol 36:597-613, 1996. Centers for Disease Control and Prevention. Morbidity and Mortality Weekly Report 49(33):755-758, 2000. Centers for Disease Control and Prevention. CDC Surveillance Summaries, June 9, 2000. MMWR 49, SS-5, 2000. Giovino, G.A. ; Henningfield, J.E. ; Tomar, S.L. ; Escobedo, L.G. ; and Slade, J. Epidemiology of tobacco use and dependence. Epidemiol Rev 17(1):48-65, 1995. Henningfield, J.E. Nicotine medications for smoking cessation. New Engl J Med 333:1196-1203, 1995. Hughes, J.R. The future of smoking cessation therapy in the United States. Addiction 91:1797-1802, 1996. Lynch, B.S., and Bonnie, R.J., eds. Growing Up Tobacco Free. Preventing Nicotine Addiction in Children and Youths. Committee on Preventing Nicotine Addiction in Children and Youths. Division of Biobehavioral Sciences and Mental Disorders, Institute of Medicine, 1995. Martin, W.R.; Van Loon, G.R. ; Iwamoto, E.T. ; and Davis, L., eds. Tobacco Smoking and Nicotine. New York: Plenum Publishing, 1987. National Institute on Drug Abuse. Monitoring the Future, National Results on Adolescent Drug Use, Overview of Key Findings 2000. NIH Pub. No. 01-4923, 2001. Pomerleau, O.F. ; Collins, A.C.; Shiffman, S.; and Pomerleau, C.S. Why some people smoke and others do not: new perspectives. J Consult Clin Psychol 61:723-731, 1993. Rice, D.P. Economic Costs of Substance Abuse, 1995. Proceedings of the Association of American Physicians, 111(2):119-125, 1999. The Smoking Cessation Clinical Practice Guideline Panel and Staff. The Agency for Health Care Policy and Research smoking cessation clinical practice guidelines. JAMA 275:1270-1280, 1996. Substance Abuse and Mental Health Services Administration. Summary of Findings from the 1999 National Household Survey on Drug Abuse. 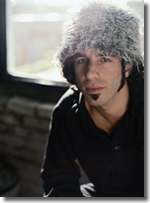 SAMHSA, 2000.